The statistics show that upselling, in which visitors are shown similar but more expensive products than the one in view, drives over 4% of sales compared to just 0.2% of sales driven by cross-sales tactics (such as displaying ‘people who bought this item also bought’). 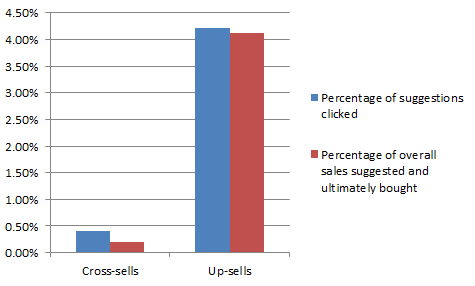 The data also shows that cross-selling can drive sales by 3% when shown on the check-out page. Get the full case study from Predictive Intent here.